I am always on the search for a good veggie burger. I especially love when a restaurant makes their own meatless patties from scratch in house and use unique ingredients- and on a recent trip to Houstons I struck gold. Houstons and Hillstones are the same restaurant with different names- it’s Houstons in some cities and Hillstone in others. Houston’s is an upscale dining experience, though not quite “fine dining” by most standards. The menu consists of entrees like prime rib, filet mignon and grilled salmon, however, we were there for one thing and one thing only- The House Made Veggie Burger. (OK- and the Kale Salad– so two things.) 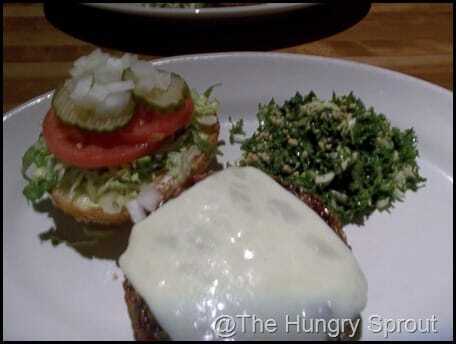 I visited with my Mother, who told me Houston’s has one of the best veggie burgers ever. 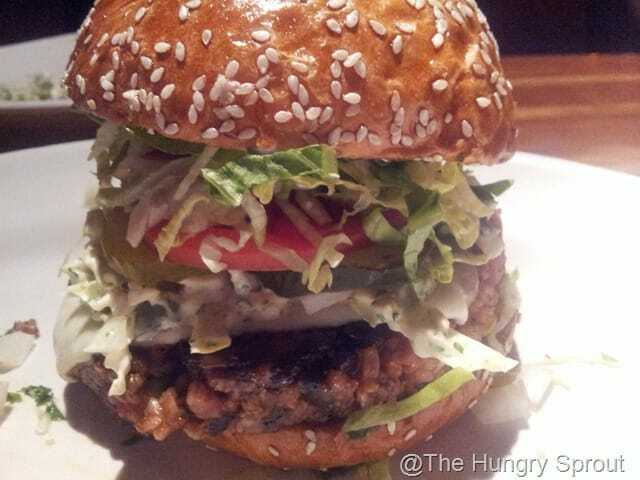 Always made fresh in house, their patty is made of brown rice, black beans and oat bran. Do not mistake this for an ordinary black bean burger, this was far too tasty and delicious to be categorized as just a black bean burger. The burger is thick and sloppy- perfect. Topped with a soy glaze, melted pepper-jack cheese and garnished with lettuce, tomato,onion and pickle, this burger can hold its own against any of its meat counterparts. However, I was told to add a little bit of Houston’s homemade coleslaw to this, thus creating our own little burger Heaven. There was no cardboard aftertaste like some veggie burgers. There was no dried out texture like some veggie burgers. There was an abundance of flavor in every bite. I couldn’t go back to Houston’s and not get the veggie burger again. 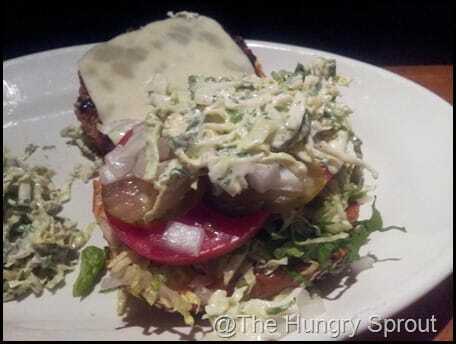 Houston’s has turned me into a Veggie Burger SNOB. I feel sorry for others with veggie burgers on their menu, Houston’s has set the bar high. The Veggie Burger is normally served with a side of fries, but we instead decided to skip the fries and instead order a side of the Kale Salad. 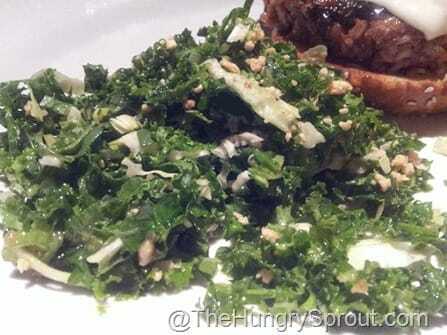 The Kale Salad was so good that I have since tried to replicate it at home three times. Truly one of the tastiest ways to sneak Kale into my diet. It was sweet, salty, tangy and sour. Tiny pieces of peanut and thin slices of Parmesan cheese round out the unique mix of flavors. Kale Salad over fries anytime. 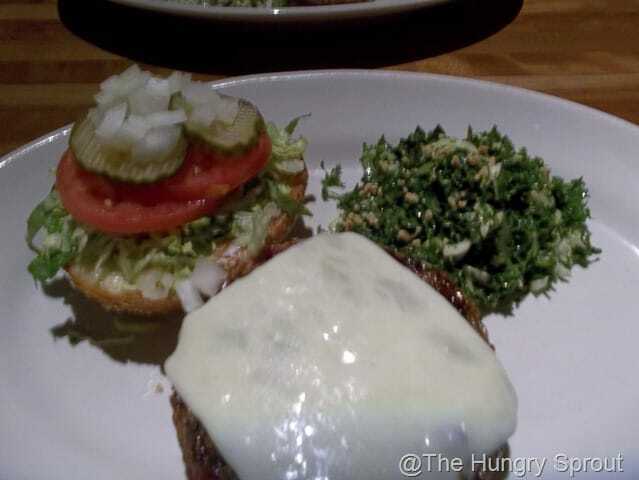 I really enjoyed my experience at Houston’s (and yes, part of it as always is also the company) and would never hesitate to recommend the Veggie Burger to anyone and everyone who may be skeptical about a meatless option. 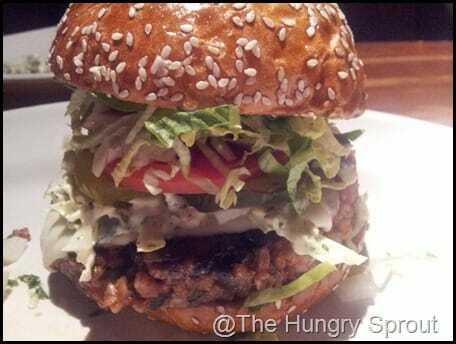 I promise you, once you eat a Houston’s Veggie Burger, you will NEVER want one of those frozen patty veggie things again. I visited the Houston’s in New Jersey just outside of New York City, however, there are other locations across the country. There is also another spot called Hillstone which is the same as Houston’s in some markets- same owners, same menu for the most part. For those of you in Orlando, there is a Hillstone in Winter Park. For the Kale Salad recipe to try at home check out Beauty and the Beets Kale Salad. Five out of five sprouts. Yes, the company was fantastic 🙂 I would stack this veggie burger against any at any place, any time. 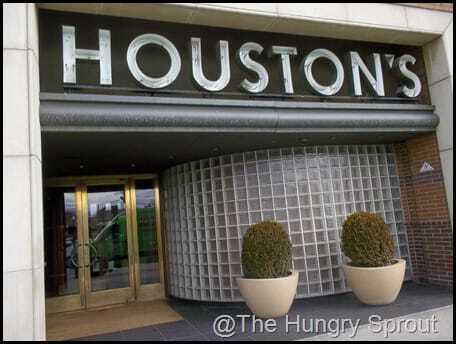 I have tried many and there is just not a single one that can measure up to this one at Houston’s (not even close). AND the cole slaw on top of it and the kale salad instead of fries is just the ultimate.